The Health and Family Planning Commission of Shenzhen Municipality and the University of Melbourne signed a Letter of Intent to form a new collaboration that will establish a world-class public mental health system in Shenzhen. The Health and Family Planning Commission of Shenzhen Municipality and the University of Melbourne signed a Letter of Intent on Friday 31st July to form a new collaboration that will establish a world-class public mental health system in Shenzhen. The centre will provide professional training for the rapidly expanding mental health workforce in Shenzhen and prepare them to deliver high quality, patient-centred care and restore maximum quality of life for people dealing with mental health conditions. "With a population of over 13 million, Shenzhen needs to rapidly expand its mental health services. Most importantly we need to further develop and build the clinical skills of our mental health workforce. 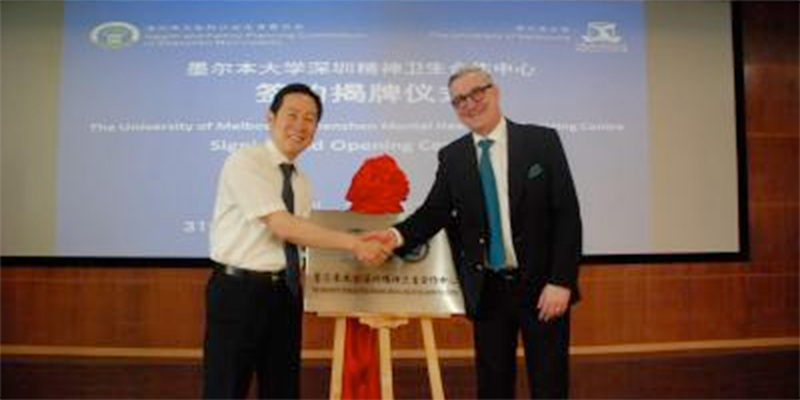 We have worked closely with the University of Melbourne's Asia Australia Mental Health (AAMH) over many years, participating in its mental health training programs and we are now very pleased that AAMH has agreed to make Shenzhen a special focus," said Professor Tiebang Liu, Director, Shenzhen Kangning Hospital. The University's work with Shenzhen will commence with growing the city's mental health critical response capacity. Presently there is only one team for the entire municipality. AAMH will begin work in early 2016 to help build 10 new teams that will cover all districts. At the same time the university will begin a longer-term project to build research capacity for the professional mental health workforce. "My time in Melbourne has given me the opportunity to understand how this city responds to the mental health needs of its residents who suffer from mental illness, for example how to respond rapidly when illness occurs and also how to support them to stay well," said Dr Ding Jun, Director, Scientific and Education Department, Shenzhen Kangning Hospital. "We are proud to be globally recognized for our progressive work in psychiatry, and look forward to sharing our experience in training and the models of community mental health services that exist in Melbourne," said Professor Ian Everall, Head of the Department of Psychiatry at the University of Melbourne." "We warmly welcome the opportunity to work together with the Family Planning Commission of Shenzhen Municipality in this mutually rewarding collaboration."